Bohermore graveyard in Galway, or the ‘new cemetery’ as it is called was opened in 1880. The cemetery contains two mortuary chapels – the western chapel was reserved for Catholic usage and the eastern one for Protestant use - and a caretaker’s lodge close to the entrance gates. The Victorian attitude to grave memorials was to make them as ostentatious as they could afford. Large family vaults and crypts were established. Church of England congregations tended to avoid crosses which were seen as too Catholic and Classical symbols like urns and columns were popular. Many of the earlier grave memorials in Bohermore graveyard have these classical symbols as part of the grave memorial. The Victorian style of graveyard and graveyard memorial reached its zenith around 1880. After this date people began to question the cost and suitability of the elaborate memorials. Following the First World War and the huge loss of life the attitude to burials completely changed and ostentation and decoration were frowned upon. The History of Galway City and County by Sean Spellissy lists some of the more famous and interesting people commemorated by grave memorials in Bohermore cemetery. The following are just three examples. Lady Augusta Gregory was at the centre of the Irish literary revival and Coole House in south County Galway became a focal point for this group. Lady Gregory was a founder member of the Irish Literary Theatre Movement from which the abbey theatre company evolved. She wrote over thirty plays and many books on history and folklore. The Gregory vault in Kiltartan was ordered to be closed by Lady Gregory around 1927 when Coole House was sold to the land commission. 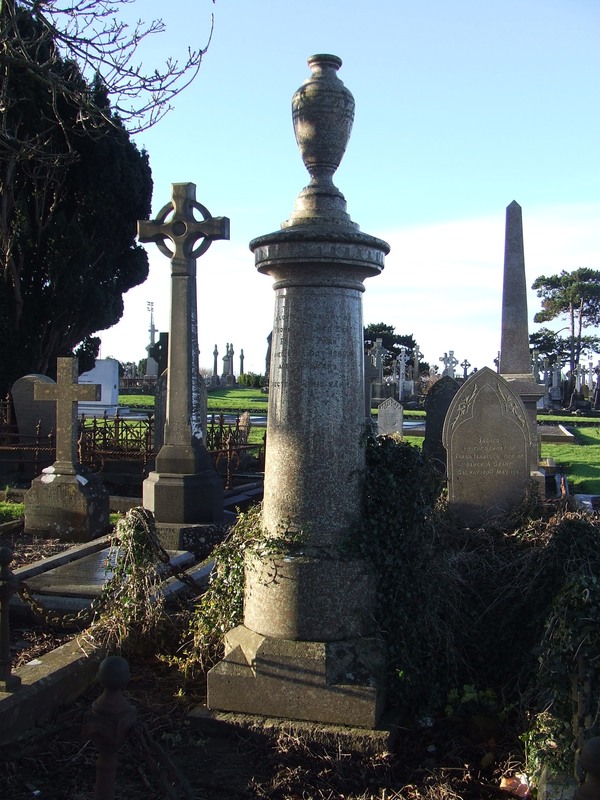 On her death in 1932 Lady Augusta Gregory was buried in Bohermore cemetery. The Internet Archive and the BBC Archive have some fabulously atmospheric recordings of Lord Haw Haw from his time as the main German broadcaster in English during the second world war. His radio shows were used by the Reich Ministry of Public Enlightenment and Propaganda to discourage and demoralise allied troops and the British population. William Joyce was executed in Wandsworth prison after the war but was re-buried in Bohermore cemetery in August 1976 at the request of his daughter. The family had strong connections with Galway and lived there between 1909 and 1921.